About a year ago I gave a new format a whirl, running through the season as it looked on the blog. As whirl’s go, it was quite nice. A delicious hazelnut whirl as opposed to death by whirlpool. So we’re doing it again. The need for Cazorla is clear. Despite selling both Cesc Fabregas and Samir Nasri last summer, Arsene’s didn’t buy a direct replacement in the form of an attacking midfielder, choosing instead to rely on Aaron Ramsey and Tomas Rosicky across the course of the season, with mixed results. Cazorla would fill that gap and add an extra dimension to the side – and, at a reported £16m, be an absolute bargain. At first glance, the signing of Sahin would be a little odd. He plays a deeper role than Cazorla, without being a destroyer. It’s an area in which Arsenal are seemingly well-stocked. There’s no doubt in my mind that the Dutchman intends to leave Arsenal this summer. The recent comments of Alex Ferguson convince me that he has probably arrived at some sort of provisional agreement with Manchester United too – they wouldn’t risk the embarrassment of going public with the bid if they thought there was a chance RVP would reject them. I made my peace with Van Persie’s probable exit a while ago, but I am a little worried about the reports of Barcelona’s interest in Alex Song. Whilst I admit he has flaws, I’m a big fan of the Cameroon midfielder, and unlike with Van Persie I cannot see an obvious replacement within the squad. What makes this divorce particularly painful is the third party: Alex Ferguson’s Manchester United. Over the years, Fergie has tried to snare several Arsenal players – most infamously, Patrick Vieira. In the past, such moves seemed improbable. United and Arsenal were simply too close in their rivalry and their status. Now, for the first time, one of our assets has been prised away to Old Trafford, and it stings. Arsenal fans will claim Van Persie left for the money. They’ll chuckle at the fact he’s ended up at a team that probably wasn’t his first choice. But the uncomfortable truth remains that he’s joined a club where he stands a better chance of winning the trophies that have eluded him for so long. Arteta looks most likely to inherit the ‘Song’ role. In an unfamiliar-looking central midfield trio of Arteta, Diaby, and Cazorla, it was the more senior Spaniard who played the deepest. With Song on the verge of completing his move to Barcelona, it’s likely Arteta will continue in that role for most of the season. Cazorla could be the signing of the season. I’m not particularly prone to hyperbole, but this guy has everything. Apart from height. And the ability to fly. I mentioned in a previous blog, but his two-footedness is quite extraordinary. Whether passing or shooting, it is genuinely difficult to tell which foot is stronger (for those who want to know, it’s his right). Song’s departure also puts a slightly different spin on our summer. A few weeks ago we had brought in Podolski, Giroud and Cazorla, and still had Van Persie. Now we’ve lost the Dutchman and, to most people’s surprise, Song. Earlier in the summer, that trio of signings looked like a considered statement of intent: we were finally loosening the purse strings to improve the squad. By selling Song and Van Persie, we’ve actually covered those costs entirely. Once again, Arsenal head towards the end of the summer in profit. It’s almost as if we planned it like this. It’s a case of three steps forward, two steps back. This summer initially looked like one of bold investment. Now we find ourselves back in profit, and with a squad that’s arguably no better than last season’s. I still think we have more than enough quality to finish in the top four, but what’s frustrating is that with one or two additions we had the potential to do so much more than that. Alongside Diaby, Mikel Arteta was immaculate in the holding role. In fact, our central midfield display was so good that the discourse about our failure to replace Alex Song almost evaporated over the course of the ninety minutes. Had we lost this match, with one-time transfer target Nuri Sahin impressing for Liverpool, the fanbase would be up in arms. As it is, Arteta and Diaby bossed it, Sahin was anonymous, Arsenal victorious, and Song forgotten. Olivier Giroud has started just two games for Arsenal. He has had just two noteworthy chances. And yet already there is talk of him being ‘under pressure’. Football has truly never been quite so hysterical and reactionary. It was telling that with Arsene giving rests to the likes of Podolski and Gervinho, Cazorla remained on the field. He makes us tick. And yesterday, he made us tiki-taka. If a new deal hasn’t been finalised by then, surely Walcott will be encouraged to leave early for a knock-down fee of £5m or so. In the meantime, his situation has seen him fall behind the developing Alex Oxlade-Chamberlain and a rejuvenated Gervinho in the pecking order. Until some resolution is found regarding his long-term future, I do not expect that to change. The big German has been unfairly judged throughout his time in England. He looks ungainly, but his intelligence, cool head, and reading of the game are invaluable. Yesterday was probably his best performance in an Arsenal shirt, but it has been coming – his recent form has been superb. Steve Bould and Arsene Wenger were both centre-backs who didn’t rely on pace in their time, and I wonder if that’s part of why they’ve embraced the BFG so wholeheartedly. Granted he had scored three goals in two games, but that didn’t suddenly make him Thierry Henry. Two of those goals were tap-ins, whilst the other was his first against Southampton – when, frankly, he just decided to put his foot through it. On that day, it flashed in to the net. Yesterday, similarly thoughtless efforts were skewed high and wide. I’m afraid he will always be erratic in front of goal. When you add it all up, this “big factor” of wanting to play through the middle doesn’t really seem to make any sense, does it? And that’s when it becomes exposed for what it is: a cover story. Another PR spin from ‘camp Walcott’ so that when he refuses to sign a new deal they can protest that it wasn’t about the money. Perhaps I’m wrong and he will stay, but this looks to me a lot like he’s getting his excuses in early. I’m a fan of Andre Santos. He’s clearly a great personality to have around the club, and going forward he is capable of great things. Tonight, however, he looked plain lazy. He wandered around the pitch, sauntering back and generally looking disinterested. 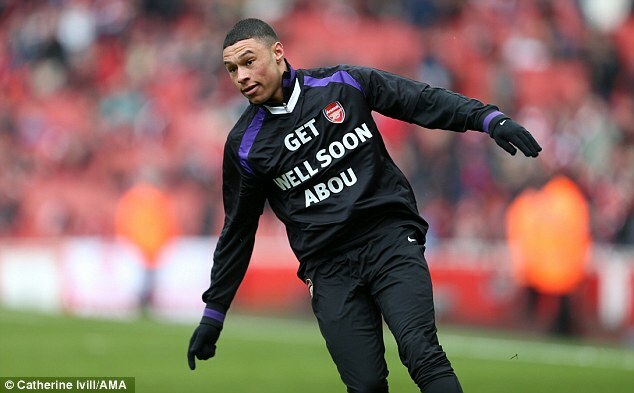 On this evidence Kieran Gibbs is not going to come under serious pressure for the left-back spot anytime soon. Giroud had to score. The defence “it was a tight angle” is not valid when the angle is only tight because of the strikers touch around the goalie. He had a perfectly good opportunity to strike before that, dallied, and paid the price. I make that three clear one-on-ones and a penalty he’s missed since joining the club. I’m not writing him off, but I am a little concerned. On which note, I won’t pretend to understand why Arsene saw fit to bring off our best finisher, Lukas Podolski, with twenty minutes to play. The performance was anomalous in its awfulness. Even in the dreary 0-0 with Sunderland, we created a couple of chances that one could describe as decent. Arsene’s relatively relaxed demeanour throughout suggested a man who had decided relatively early on that this was just ‘one of those days’. I hope, for all our sakes, that he’s right. Arsenal desperately need to sign a striker. I’m not sure this requires much expansion. In a world in which Demba Ba is available for just £7m, there is no excuse for Arsene not bringing in a reliable front man in January. If the AGM had been a month or so ago, it might have been a very self-satisfied affair. The new signings looked inspired, we were defensively solid, and being talked about as genuine contenders. That AGM would have been misleading: it would have overlooked some of the crucial issues that it was essential to raise yesterday. But by the same token, a couple of bad results shouldn’t cast an ugly light across the entire club. Arsenal don’t need saving: they just need to get a bit better. Starting tomorrow. Jack Wilshere was every bit as good as I expected him to be. I’d love to sit here and say, “I’d forgotten how good he was”, or “I did’t expect him to be quite so good quite so quickly”. I’d be lying. I did. The first half was abject, then apocalyptic, then embarrassing. The second half was acceptable, then alluring, then astounding. Extra-time was just plain bonkers. I’m not worried about shirt-swapping or referee decisions or anything else: I’m worried about this team. The decline in recent weeks has been alarming. Leaving aside that anomalous League Cup game, the first team have lost three of the last four. On Tuesday night we face an intimidating trip to Schalke, and we’re only a couple of weeks away from a massive North London Derby. We need to stop the rot. At the moment we have slim trophy hopes and bleating fans. We’re dangerously close to turning in to Liverpool. The “Steve Bould has fixed everything” narrative was a myth created by people who wanted to use it as stick to beat Arsene Wenger with. And as for the ‘zonal marking’ on the corner from which Berbatov scored, I have to confess I simply can’t see the logic in leaving opposition players to make untracked, unmarked runs and attack the ball. Also, I am conscious this may be heresy, but I’m not sure about the validity of keeping Santi Cazorla in the central three. He drops in to wide areas to look for space, which means that the two left behind occasionally look a little isolated. So there we have it: 5-2 again. Same result; different sensation. Because of the sending off, I feel like this game won’t have the same seismic impact on either of these teams’ seasons as the previous 5-2. Last time, Spurs’ collapse came from a greater position of dominance, and was more complete in its cataclysmic hilarity. This time, they have mitigating circumstances. They can blame Adebayor’s stupidity rather than their own inadequacy. I expect their wheels to wobble, rather than come off entirely. Whatever you think of Arsene, you can’t knock his record in the early stages of European competition. Arsenal have now qualified for the knockout phase for the 13th time in his reign – I believe it’s now twelve years on the trot. With Chelsea and City both set to go out, it shows you just what a feat that is. Arsenal fans are often berated by the media for their supposed impatience. The truth is that at any club other than Arsenal, the pressure on Arsene Wenger would be approaching unbearable. From 15 league games – almost half a season – we have won only five. We’ve lost four; as many as 17th place Sunderland. We’re 15 points behind the league leaders Manchester United. Distressingly, we’re now as close to United as we are to rock-bottom QPR. We’re just one league place ahead of Liverpool; a club whose mid-table mediocrity we are in serious danger of emulating. …whilst Chelsea’s mini blip means we’re only five points off third. We’re in the fortunate position of being in direct competition with teams which are as flawed as our own. If we can get it together, Champions League qualification is still very much within our grasp. Both board and manager are wedded to our existing philosophy. They’re knotted together, each guilty of leading us in this purgatorial fourth-place pursuit. I’d love to be proved wrong about that, just as I’d love to be proved wrong about my growing suspicion that the decline of Arsene’s Arsenal is terminal. I’ve waited for so long to see him lift a trophy again, and now I don’t believe I ever will. I want so badly for this club to top up my drink, and make it seem half-full again rather than half-empty. I want something to change, and I’m scared it won’t. Stagnation, it’s worth remembering, leads to rot. I’m not saying he’s a bad player. I think he’s a very good one. I’m just not sure he’s the right one. For years, people talked about Arsenal needing a target man as a Plan B. Finally, they have one. Giroud looks twice the player of Chamakh at the moment, and will doubtless become an important part of the squad. There are times when we will need him. But his style is opposed to that of the team. He doesn’t fit Plan A.
Whilst I should have been lost in ecstasy over Walcott’s outstanding display, I was instead consumed with the thought that Theo Walcott might finally be about to explode in to the player he’s long threatened to be, just six months before he walks out of the club on a Bosman free. As for Demba Ba, if we don’t try to sign him for £7m then it is tantamount to mismanagement. I made a point of watching him carefully from behind the goal, and his power, movement and finishing is outstanding. Walcott and Giroud’s goals were heartening, but we’re still in need of more attacking options, and with Premier League experience and an affordable price tag, Ba fits the bill. The fact that we have Arteta shouldn’t prevent us chasing a defensive midfielder. The fact that we have Cazorla shouldn’t rule out the pursuit of a schemer. And the fact that Theo Walcott has had a handful of decent games through the middle certainly shouldn’t prohibit the signing of a striker. Quality and competition provides flexibility. This was an inflexible Arsenal performance. Signings are the antidote. Chamakh’s departure, as well as Gervinho’s time at the African Cup of Nations, leaves us very light upfront. I considered a striker a priority before the window – now it’s nothing less than a necessity. Worryingly, our options seem to be decreasing all the time: Demba Ba has joined Chelsea, Huntelaar has re-signed at Schalke, and Fernando Llorente is in talks about a Bosman move to Juve. I’ve read the stories about David Villa, but I can’t see that one happening. The obvious signings have all disappeared from the table. That said, Arsene has never really been one for the obvious. Let’s hope he’s got a trick up his sleeve. I am merely struggling to understand how an unconvincing draw with Swansea has done so much to erase Arsene’s belief that this team needs reinforcement. Our rivals will doubtless continue to improve around us, so we ought to push on and do the same. If we don’t, there is a very real risk that we will fail to achieve our basic goal for the season: Champions League qualification.If our squad is “complete”, then why are Arsenal sixth? All the talk before this game was of the exorbitant prices fans were asked to pay to watch the match. It felt particularly expensive for Arsenal fans when Laurent Koscielny’s red card effectively ended the contest after 10 minutes. If Arsenal and Arsene continue to neglect their responsibility to improve the squad, Jack will go the way of Cesc. And Van Persie, Nasri, Clichy and Song. Jack’s enthusiasm and love for the club was entirely evident against City, but no player is immune from disillusionment. Years of stagnation and decline will wear that affinity thin. We’ve seen it before. Let’s not let history repeat itself. In the last two matches, Wilshere’s development has accelerated dramatically. This isn’t the Wilshere we remember. This one’s better. This Jack Wilshere is armoured with months of gym work and a fierce desire to make up for lost time. He is physically and mentally stronger for the ordeal he has suffered, and it shows. The truth is that Walcott is the lucky beneficiary of a perfect storm of circumstance. Arsenal could not afford the PR disaster of losing another one of their perceived stars. The club is also under more pressure than ever to show ambition in their expenditure. Every time Walcott produced on the pitch, the likelihood of Arsenal caving to his demands increased significantly. I don’t subscribe to the belief that failing to make the top four could ever be a ‘good thing’. We need to be there, and I still believe we can. However, a couple of additions could make all the difference. The one upside to our poor run is that it comes at a time when it’s possible to do something about it. I know it’s cold outside, Arsene, but it’s time to open the window. Let’s not kid ourselves: however well Giroud played, he’s no Van Persie. However, in the last few days he’s made a convincing case for a prolonged run of games at centre-forward. I still feel we would benefit from a signing in this area, but if someone does arrive they’ll have to oust a Frenchman in form. Arsene’s relationship with the market seems to have been irrevocably soured by the sages over the likes of Fabregas, Nasri and Van Persie. Meantime many of his own signings have floundered. In the last few years, transfers have been more hurtful than helpful. He’s wrong to be dismissive of transfers. People rightly laugh at cheque-book managers, but good recruitment is a skill. There are deficiencies in Arsenal’s squad and a club with our resources ought to be able to correct them. Monreal is a great start. The idea that Jenkinson is ready to displace Sagna is nonsense. I for one hope that we keep the Frenchman by giving him the long-term deal he craves. If he leaves this summer, as appears increasingly likely, we’ll need to bring in someone with the requisite experience to fill that spot. 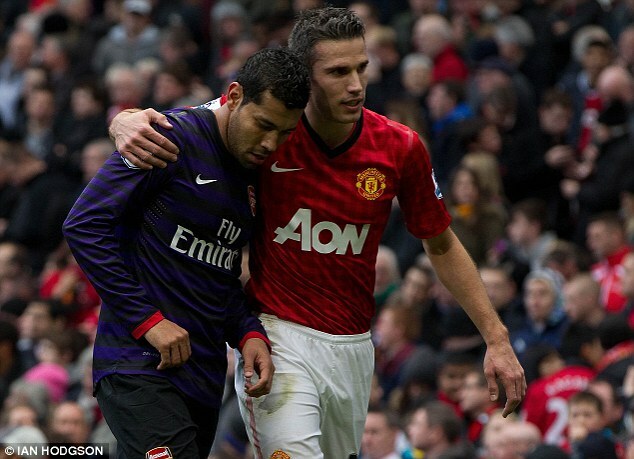 On Andre Santos: I can’t help but feel that the infamous shirt swap incident with Robin van Persie was a huge catalyst towards his departure. On that day, he lost the fans, and it’s almost impossible to come back from that – just ask Emmanuel Eboue or Nicklas Bendtner. Every mistake is highlighted; every indiscretion scrutinised. I’m not sure that Santos has been more error-prone than many of our other defenders, but the tide turned against him on that November day. It’s moot, anyway. Arsene Wenger is no closer to leaving Arsenal today than he was on Friday. Negative results do not edge him closer to the door; only time and the running down of his contract do that. His current deal runs till 2014, and I find it impossible to foresee him leaving before that date. He may even be handed a renewal. The extrication of Arsene Wenger from Arsenal will be a long and painful process, for both sides. I’d argue it’s a process that is already underway. It began when Cesc Fabregas and Samir Nasri abandoned Arsene’s project, and will end the day whatever contract he is bound to is allowed to expire. Ivan Gazidis will not push him. Arsene will not jump. In the meantime, here we are: stuck in the middle of the end. I didn’t join the chorus of boos at full-time: Arsenal lost fair and square to a better side. I hoped for more, but it would have been madness to expect it. However, the result has compounded the pain of the FA Cup defeat. Within the space of a few days, the focus of our season has narrowed dramatically: it’s suddenly looking like fourth or bust. Arsenal’s defensive line looked like it’d been drawn on a spirograph. Playing a high line against the likes of Bale and Lennon is always a risk, but doing so when your defence is bereft of any kind of organisation borders on masochism. It’s not quite over. Their fixture list gets a lot trickier over the next six weeks, and we also have the possible boon of a Chelsea implosion to look forward to. Arsenal can still make the top four, but if we do it’ll be in spite of our own self-destructive tendencies. Contained within this performance was the DNA of an Arsenal team capable of hauling its way back in to the Champions League. Arsene Wenger must play John Hammond, extract it and bring it back to life before our very eyes, starting this weekend at Swansea. Tomas Rosicky is a bit like Wigan. Or blossom. Come spring, he comes to life. Since losing the Derby at Spurs, Arsenal have won four games, scoring ten goals and conceding just two. 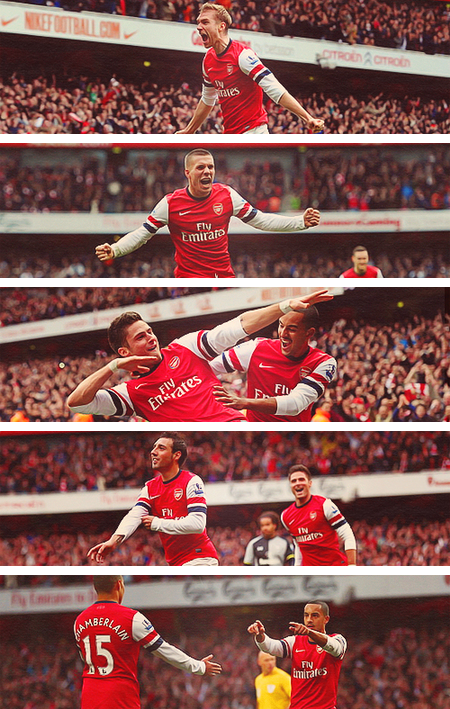 We have the momentum, and we have Tomas Rosicky. The omens are good. We just need to keep it going. The cannon is rolling in to position. Time to blow away the opposition. Giroud is popular among the fans, but that oughtn’t disguise our need for someone superior. His defenders will point to the 17 goals he has scored, and with some justification, but I’m reminded of Emmanuel Adebayor in 2007/08. The Togolese totem-pole racked up 30 goals, but was rebuffed in most quarters with cries of, “Well how many should he have scored given the chances he’s missed?”. If you’ve played Football Manager or FIFA 13, you might think you know how the transfer window works.You’d be wrong. I enjoy the race for fourth, because it provides the illusion of genuine competition. As a supporter, you crave contesting something until the last second of the season. The thrills and spills of that kind of topsy-turvy battle are what make being a fan such an enthralling experience. However, it’s not a real trophy. It’s a surrogate. There was no ‘Great Escape’ for Wigan, but there may yet be one for Arsenal.Arsenal now know that a win at Newcastle on Sunday will confirm our top four spot. Considering where we were languishing after losing to Spurs a couple of months back, it’s a hell of a turnaround. I think we’re all agreed that qualifying for the Champions League will never replace the ecstasy of winning a trophy. However, it would enable us to put a conciliatory gloss on what’s otherwise been a painful season. What’s more, it would allow us to laugh at Tottenham. Again. The feat of making the top four for 16 consecutive years is impressive, but hearing Arsene trot that record out with increasing frequency makes me uncomfortable. On the weekend of Alex Ferguson’s retirement, it was telling that among the 13 Premier League titles, five FA Cups and two Champions Leagues, his 22 consecutive top four finishes passed without mention. If fourth place is any kind of prize, it’s a runners-up medal. For a club of our size, it’s oughtn’t be an aspiration but a conciliatory accessory to failure. It’s simple, really. Don’t aim for fourth; aim for first, hit fourth if you fail. Shoot for the moon. Even if you miss, you’ll land among the Champions League’s assembled stars. So that was that. Looking back over it, the joy of the final day really pales in comparison to some of the earlier angst. Still, it’s far better that way round – makes the summer far more bearable. It’s that time again, when I metaphorically hand out fictional awards to players who will never actually receive them or know they’ve won. Let’s get straight on with it. Last year Arsenal hand a stand-out winner: footballer of the year Robin van Persie. In the wake of Van Persie’s departure, Arsene Wenger made it plain that responsibility would have to be shared more equally throughout the team. Nevertheless, one man rose above the rest. It’s a good job he rose, because he’s so small that frankly you’d have difficulty spotting him otherwise. Santi Cazorla has had an outstanding first season in English football. I’d second Arsene Wenger’s sentiments in wondering aloud just how he wasn’t voted in to the PFA Team of the Year. Few players in English football have demonstrated Cazorla’s combination of style and stoicism; technique and tenacity. Cazorla is that rare thing: a flair player with real guts. His numbers aren’t bad either: in the Premier League alone, he managed 12 goals and 12 assists. The first thing that struck me about Cazorla in pre-season was his remarkable two-footedness. He is genuinely ambidextrous, able to torment defenders by shifting on to either his left or right foot with equal ease. That two-footedness is a hallmark of the astonishing degree of technical excellence which Cazorla brings to all aspects of his game (with the disappointing and typically-Arsenal exception of set-piece delivery). At the start of the season, Arsene understandably sought to build the team around the diminutive Spaniard, fielding him in a central playmaking role. As the campaign wore on, pragmatism took hold, and Cazorla was confined to the left wing. It is testament to his intelligence and versatility that his influence has not waned. No player has had a more consistent presence in the first team: Cazorla has started 47 games this season. That underlines his important to the side. We simply wouldn’t know what to do without him. Cazorla was the obvious candidate for me, although I’d also like to give a quick mention to two other players. Firstly, Per Mertesacker deserves credit for a hugely consistent year. Many expected him to fall behind Laurent Koscielny and Thomas Vermaelen in the battle for places at centre-back, but instead he emerged as the lynch-pin of our defence. I can’t help but feel Steve Bould sees something of himself in the lanky German. Theo Walcott also warrants praise for his best season to date. In just 31 starts he amassed 22 goals and 15 assists. Our collective frustration with Walcott would be better exercised elsewhere: when we needed him, he invariably produced the goods, and his decision to stay with the club was undoubtedly one of the high-points of the season. Once upon a time the Arsenal team was full of striplings, and this category was hotly contested. Previous winners include the likes of Cesc Fabregas, Alex Song and Jack Wilshere. However those kids have either graduated, grown up, or been injured a lot. The Arsenal team these days has a more grizzled look to it. The likes of Mertesacker, Sagna, Arteta and Cazorla raise the age profile of the side considerably, and even our Carling Cup side this term had an unusual degree of experience. Of the remaining Arsenal tyros, there were high hopes for Alex Oxlade-Chamberlain, but he struggled to meet the unfair levels of expectation. Carl Jenkinson had an excellent start to the season that saw him earn an England call-up and a new contract, and he’ll hope to challenge for a first-team spot on a more consistent basis next season. I toyed with the idea of giving it to Kieran Gibbs, but decided that at 23 he was probably too old. I hate seeing the PFA dish out Young Player awards to the likes of James Milner when he’s well in to his mid-twenties. However, at the start of this season, Aaron Ramsey was just 21. He was also something of a lightening-conductor for the Arsenal fans’ frustrations. If not every misplaced pass was met with a boo, they were certainly met with a collective tut of disapproval. By the end of the season, however, he had emerged as one of the team’s most important components. Ramsey’s season mirrors Arsenal’s own. In the first half he looked out of sorts. He was trying things he didn’t necessarily have the skill or the confidence to pull off. In the second half, pragmatism took hold. Ramsey, like Arsenal, kept it simple and reaped the benefits. 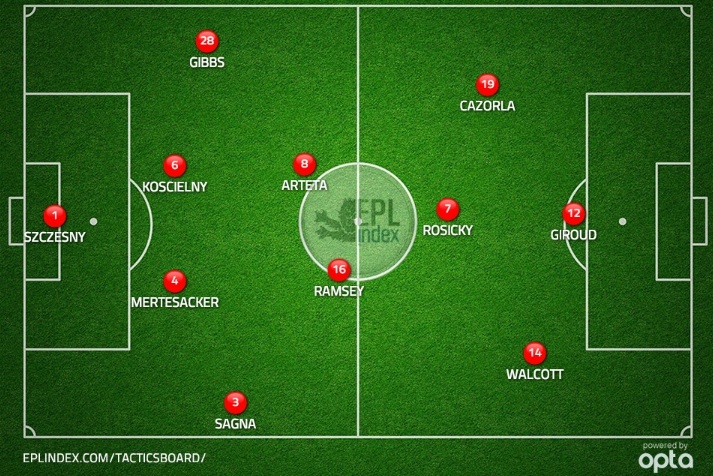 Alongside the efficiency of Arteta, Ramsey’s energy and effervescence has proved invaluable. There are some players who disappointed this season. Bacary Sagna fell below his previously immaculate standards, and Thomas Vermaelen’s performances lacked the discipline you’d expect of an Arsenal captain and centre-half. Then there are some players whose contribution was plain poor. Our record signing Andrey Arshavin failed to make a single Premier League start, and even when called upon rarely looked like a player itching for 90 minutes of action. Then there is Andre Santos. When it comes to this award, it’s impossible to see past the Brazilian – and that’s not just because of his expanding waistline. I actually think the stick he received for his half-time strip session with a certain Dutchman was way overblown, but it remains impossible to defend some of his performances on the field. Although his loan spell with Gremio is about to come to an end, it seems Santos’ Arsenal career reached its own conclusion the moment we signed Nacho Monreal. There was a period before Christmas when Arsenal played with all the self-destructive madness of a radicalised lemming. The consequence was a series of unbelievable matches. The 7-3 with Newcastle is noteworthy not only for the unusual scoreline but also Theo Walcott’s breathtaking hat-trick. Beating Tottenham 5-2 is hard to surpass, although seeing as it’s becoming an annual thing there’s no need to lavish it with another award. Like that swotty child in school, it can’t win the Maths prize every year. This season managed to provide far too many contenders for this category for my liking. The home defeat to Swansea was probably as volatile an atmosphere as the Emirates has ever experienced. I remember leaving the ground that day wondering if Arsene would be forced to resign. The players were apathetic and the crowd were apoplectic. However, the cup defeats to lower league opposition take the biscuit. Blackburn was bad; Bradford was worse. To lose to a team in League Two, with effectively our best team on the field, was humiliating. The fact that defeat also robbed us of a fantastic chance to win a trophy merely rubbed salt in to the not inconsiderable wound. I was so stuck for what to write in this bit that I opened it up to Twitter. As ever, there were some cracking suggestions: Per Mertesacker’s thumping header against Spurs; Tottenham fans celebrating an imaginary goal on the final day; Jack Wilshere’s long-awaited return. In the end, I’ve simply had to plump for the end. This was not a vintage season for our club. I’d be lying if I said I wasn’t glad to see the back of it. We celebrated on the final day, but it was more an escape than an achievement. Fourth place is often compared to a trophy, but for a club of our stature it’s more comparable to surviving a relegation scrap. We felt relief rather than joy. There were so many – and sadly, so many that are now horribly familiar. Our utter failure to contest the major trophies is something that is becoming soul-crushingly customary. For the sake of variety, I’ve decided to opt for an unusual choice: the plight of Abou Diaby. When scrolling through our statistics to make my choice for Player of the Season, I was genuinely jolted by seeing Diaby’s name: I had forgotten he played for us. That rapid decline is all the more remarkable when you consider that at the start of the season he was turning in man of the match performances against the likes of Manchester City. Sadly, since then he has succumbed to another major injury. I’m not sure how many more there will be in his career. Arsene Wenger has shown enormous faith in Diaby throughout his struggles, and Diaby himself has shown tremendous courage to fight back from a succession of blows. However, after this latest blow I can’t help but feel that Arsene’s faith and Diaby’s courage will be wearing as thin as the cartilage in the Frenchman’s knackered ankle. So there you have it. Tomorrow I’ll be taking a look at the season as a whole through the prism of the blog. Till then. So that’s that. Imaginary red ribbons have been tied around the ethereal fourth-placed trophy. Arsenal have qualified for the Champions League. Well, sort of. There’s still the significant matter of a preliminary round to navigate after Chelsea beat Everton to secure the automatic third spot. It’s a hurdle we’ve overcome several times in the past, and barring an unfortunate draw I’d expect us to do so again. Crucially, Arsenal have also managed to finish above their rivals Tottenham. Again. I think we all understand that qualifying for the Champions League is important. Finishing above Spurs is just plain fun. As luck would have it, I was working during the game, which spared both my nerves and my nails. There’s something curiously appropriate about the fact that at the end of a season in which I’ve often felt oddly detached from the side, I was absent at the very moment their fate was decided. That’s not to say I wasn’t delighted. Arsenal did a difficult job well. Since the derby defeat to Spurs, Arsenal have won eight of their 10 league matches, drawing twice. This match was won in the pragmatic style that has defined this final part of the season. I’d have been lying if I’d said I had absolute conviction that Arsenal could follow that mantra on a regular basis. However, Arsene Wenger has managed to set aside his love of flowing football and focus on the only thing that matters at this stage of the season: results. We compromised on some of our principles; we also conquered a good many of our problems. 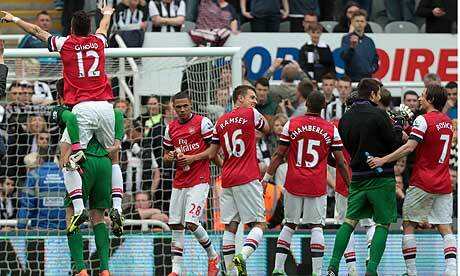 That Laurent Koscielny was the clear match-winner yesterday typifies our recent resolve. Not only was he was scorer of the vital goal for the second year in succession, but he was also absolutely outstanding in defence. In Koscielny and Mertesacker, Arsene Wenger has uncovered a central defensive pairing with communication, balance, determination and no small amount of ability. That partnership, much like this Champions League qualification, is a foundation on which to build. Some pundits have seen fit to criticise the Arsenal players for celebrating yesterday’s events with such vigour. Frankly, I don’t think it’s up to them to determine how happy our players should be. What’s more, such a view seems churlish in the extreme. In spite of everything that’s come before, Arsenal’s recent run is an achievement worth celebrating. We had a clear goal: to salvage the situation and finish fourth, and we did it. What’s more, we did it at the expense of our closest and most loathed rivals. To allow that to pass without celebration that would be bizarre. Remiss, even. There are those who say there’s no point qualifying for a competition you’re unlikely to win. These snipers are the same folk who hold the trophy-hoarding example of Chelsea aloft as a superior model of management. Chelsea will be roundly praised for having won the Europa League this season, but it’s worth remembering they only competed in the competition as a consequence of exiting the Champions League – before Arsenal. While I’m picking that bone: what a ridiculous system that is. Arsenal qualify from their group and go out on away goals to a Bayern Munich side who later beat Barcelona 7-0 on aggregate, yet Chelsea are allowed to remain in European competition and have another crack at silverware despite failing to even make it through their group. I struggle to see the logic there. Anyhow, I digress. Qualifying for the Champions League is important for us. It keeps both the bank balance and the reputation of the club healthy. It’s not the be-all, but it’s certainly beneficial. However, I don’t think it makes this season a success. Our domestic cup campaigns both ended in defeats that were not only humbling but humiliating. As for the league campaign, I suspect I will come to look back on this season as an opportunity missed. Take a look around the other major clubs: Chelsea spent a season battling their own supporters after the appointment of a manager they detested. Manchester City had the worst summer they could possibly have had, missing out on Van Persie and Hazard and settling instead for Jack Rodwell and Scott Sinclair. United may have waltzed to the title but even their own fans will admit this is far from Ferguson’s strongest side. The noises coming out of Arsenal now suggest that they’ll have money to spend this summer. That’s good news, but has to be tempered by the fact that market-place is set to be crowded with other big spenders. Messrs Moyes, Mourinho and Pellegrini will all be wanting to put their own stamp on their new teams, and however much our budget might have swelled it is unlikely to match theirs. The advantage Arsenal have is that of consistent leadership. Arsene Wenger will be comfortably the longest-serving manager in the Premier League next season, but with that comfort comes an element of danger. When asked about new recruits in the aftermath of yesterday’s game, Arsene urged the importance of ‘stability’. My fear is that stability and complacency could go hand-in-hand. It’s essential that Arsenal push on and do their utmost to make an impact in the market. Tread water for long enough and you drown. Newcastle Preview: Jubilation or Recrimination? It’s tempting to compare this to cup final day: a one-off game to decide the destiny of the sole remaining prize on the table. Typically of Arsenal, however, we’re talking about a cup without a trophy; a prize without a medal. Champions League qualification is rightly a priority for the club, but it brings with it no formal garlands. Nevertheless, it’s important. Supporters are generally united in their desire to see Arsenal flex their financial muscle this summer; European qualification makes that infinitely more likely. It’d also us to avoid the significant heartache to be pipped up at the post by our neighbours and rivals, Spurs. It’s in our own hands. Victory at St. James’ Park guarantees fourth place; perhaps even third if Chelsea slip up at home to Everton. Tottenham know they must beat Sunderland at home to stand any chance of leap-frogging us in to the Champions League. Arsenal ought to have enough to secure three points today. In these end of season games, the side who needs victory more generally takes it. Footballers are hard to motivate at the best of times, and Pardew will have a job getting his lacklustre Newcastle side at the races for a game that matters little to them. News broke last night that Newcastle owner Mike Ashley has offered a £1m bonus to the non-playing staff should they beat Arsenal. That doesn’t change much. Incentivising the dinner ladies is somewhat redundant when the dinner ladies are unlikely to be playing. I suspect the circulation of this story is a PR move designed to counter Alan Pardew’s ridiculous assertion that he “didn’t care” if the Toon Army got tonked now they’re safe from relegation. As far as the team goes, I’d stick with the same back four that started against Wigan. Nacho Monreal has generally started the away games, but this is no time for rotation, especially at the back. Olivier Giroud has returned from suspension and I’d favour immediately reintroducing him to the side. Podolski finished well twice against Wigan but his contribution to the rest of our play was minimal. Giroud provides a focal point and could prove useful for set pieces at both ends. Finally, if there’s any way at all we can Mikel Arteta on the pitch, we should. Even if he can only manage an hour, it could be vital. He is the de factor captain of the team, and there is no direct replacement for him within the squad. If he picks up another knock and has to come off, he has several months to recover. One thing is certain: Arteta himself will be desperate to play. When Arsenal take to the field at 4pm, I’ll actually be at work. I’ll finish at almost exactly the same time as the match, and log on to furious recriminations or wild jubilation. It seems absurd that a 38-game season can be decided on one match, one point, one goal. That’s because it can’t. Whatever our final league standing is come 6pm, it’s important to remember that’s not so much down to the events of today as it is the story of the entire season. Whatever happens, a backwards step will be required to assess this season properly. There’ll be time for that next week. For now, it’s time to cross all available digits and hope for the best. Come On You Gunners. There was no ‘Great Escape’ for Wigan, but there may yet be one for Arsenal. Arsenal now know that a win at Newcastle on Sunday will confirm our top four spot. Considering where we were languishing after losing to Spurs a couple of months back, it’s a hell of a turnaround. …and when Theo is racing, no-one is going to catch him. Walcott’s critics occasionally accuse him of self-interest; they say he plays to please himself rather than the team. If that’s the case, Theo plainly really doesn’t want to play in the Europa League, as from the first minute to the last he hared up and down the pitch like a man possessed. I prefer to think this performance was a consequence of Walcott’s continued maturation in to one of the side’s senior figures. His stats this season are quite incredible. In just 30 starts he has now amassed 22 goals and 15 assists. You will struggle to find a wide player with more impressive numbers in world football. Despite his two goals tonight I would favour an instant recall for Olivier Giroud for the game at Newcastle. There’s no doubting Podolski is an outstanding finisher, but he doesn’t yet share Giroud’s ability to link the play. He may develop those attributes in time, but time is not on our side. At several points in the game I was baffled by Podolski’s reluctance to burst in to the box to meet crosses from either flank. He may wear the number nine on his shirt, but he’s far happier as a number ten. The former Arsenal full-back was given a torrid time by Callum McManaman at Wembley on Saturday. In this match, Arsene opted for Gibbs over Monreal to cope with the tricky winger, and the youngster coped admirably. He was coached through the game by Steve Bould, who regularly passed on advice to Gibbs from the touch-line. It paid dividends, as McManaman was mostly subdued. Gibbs’ positional play and anticipation were as good as I’ve seen him produce. Ramsey’s season is in some respects a microcosm of Arsenal’s own: a dreadful first-half followed by a spirited and encouraging return to form. This wasn’t his best game – his passing was occasionally wayward – but it’s impossible not to admire his sheer energy. …simply because it would be remiss not to. Four assists in one game is some feat. The Premier League is lucky to be graced by a player of his outrageous ability. I wasn’t alone. The Arsenal fans gave a rousing ovation to Shaun Maloney and a warm farewell to the Lactics, and I don’t think it was borne out of pity. It saddens me to lose a side as attractive as Wigan from a Premier League still containing the likes of Sunderland, Norwich and Stoke. For half an hour of this match, before fatigue and familiar errors set in, they had us on the ropes. However, ultimately this season has proved an escape too far. When the players departed on their awkwardly titled ‘Lap of Appreciation’, Bacary Sagna traipsed behind, accompanied by two of his children and dishing out lingering waves to the crowd. It doesn’t take a genius to decode the message: this may well have been Sagna’s final Emirates appearance. If he does leave, he ought to remembered as a fine player and a tremendous servant. Some of his performances this season have been below par, but then how many players suffer two broken legs in their career and return to their previous level?